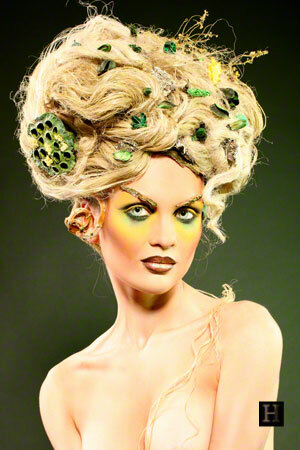 It doesn’t get quirkier and funkier dolling up your way for the celebratory moments at Halloween. From ghosts to goblins, witches to fairies and maybe new-age Harry Potter fangirling sagas, the aim is to look unique, indispensable and outstanding. Today, we have for you 22 hairstyles for women, so funky and chic, we bet you wouldn’t want to think of anything else as a scandalous statement to flaunt! Play with streaks of pink and black all over your hair, and tie two ponytails with a messy touch on either side. Keep the makeup semi-Gothic with red for the lips and dark kajal for the eyes! The spiked up crazy and very razzle-dazzle Mohawk look is what seems to be pretty haute for the Halloween festivities each year. Should you opt for the same, make sure you invest in high quality hairspray or gels. 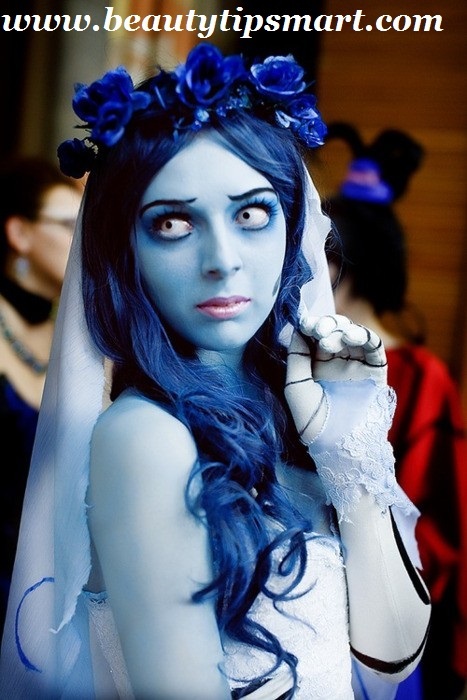 Make it a little scarier than the usual with white and blue makeup touches and very dark eyes for the look to complete with. The hair should have a tinge of dark blue all over and with blue roses for the crowning glory effect. Much on the lines of a bouffant, but this time very elaborate, the Martian hairdo with a chic ensemble can make heads turn. Long haired PYTs can try this sassy hairstyle, provided you have props such as a bee honeycomb and a couple of plastic bees to use as embellishments. Comb your hair straight and with a middle partition on both sides. 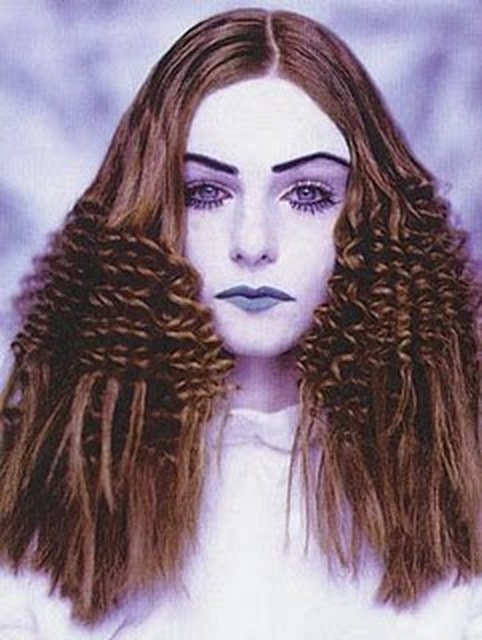 Crimp the hair in the middle and allow it to fall over your shoulders. The eye makeup should be the prime focus here, which brings about the scary effect. 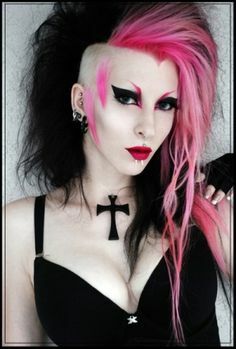 Should you want to up the ante and dare to shave the sides a little, dare to try the funky pink and black quarter Mohawk look? 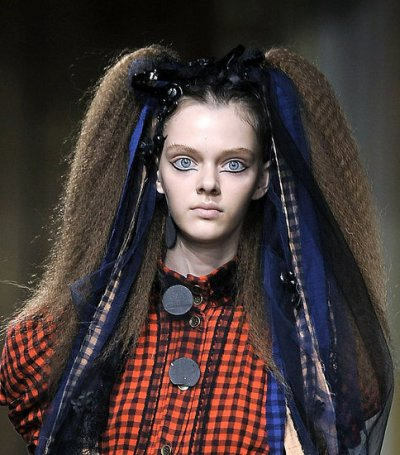 Be the Gothic queen and grab all the attention with a superfluous and a very funked up hairdo at the Halloween bash. Fancy the look of a cute poodle, to distract the evil tones behind? Try the perms on the crown and the length of the hair below! Curl up three buns for the crowning glory effect and let loose the wavy tresses everywhere across the shoulders- spook them out who watch you with those quirky glasses in these hairstyles. Short pixie hairdos and would still like to flaunt the spooky look with utmost funk and style? Rub those colors in and you are ready to flaunt that statement look. Heavy and large, big and wild, in all colors you could possibly play with! Color blocks aren’t for clothes alone, not when you can use temporary colors to doll up the tresses in chic ways! Instead of the brunette and blonde touches, let the rockabilly chick come out this Halloween burning everyone around with green envy. Vampire hair in all orange and with the motif of half a pumpkin! Make sure to use plenty of hairspray to keep the look in place for sure. Try the mullet Mohawk with touches of shags and feathers this Halloween; glaze it up with pink and auburn shades! Icy blue and cold, the look says it all. You would need plenty of hair mouse and a razor for this look. Instead of using real streaks, opt for a wig with hair extensions in pretty dark neon shades, which bring about the night light effect using these hairstyles for women. So, here were some of the coolest funky hairdos for you to flaunt. If you have ideas of your own to share, do write in! Have fun and happy Halloween!